← Let’s keep this a secret. Bear with me. This is a long intro. What started as a Twitter discussion about how to explain death and tragedy to children—such as the event Aurora, Colorado—became a discussion about “evil”. Unfortunately, the challenge (and the charm) of Twitter is the 140 character limit. Complex ideas are difficult to express. During the chat I made a simple comment: “If you’re talking about WHY people kill, it’s a good time to talk about mental illness.” My point being, if you’re helping young children to understand why someone would consider, plan and carry-out such an horrific act, it might be a good time to help kids understand that some people suffer from mental illness. I don’t have the stats, but I suspect that many mass murderers have had visits with psychologists or counsellors at some point. 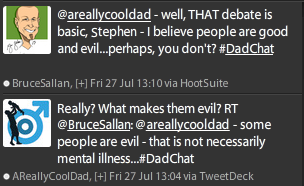 “I think it’s a mistake to say all (mass) killers are mentally ill” tweeted Bruce Sallan, the host of #DadChat. Again, tweets limit explanation. My point was simply that there is a social stigma to mental health issues, and many people don’t seek the help they need or find help for someone they love. Strong emotions are normal, but when depression, delusion or obsession start to affect our behaviours, we need to seek help to understand. When a tragedy occurs, perhaps it’s a good time to talk with your children—in an age appropriate way—and let them know that it’s okay to talk with people they trust, especially about feelings of violence or anger. Most are normal feelings that pass, but sometimes we need the help of our family, community or professionals. “Really? What makes them evil?”, I asked. In stories, evil characters are interesting characters. They give heroes a nemesis; a raison d’etre. I understand why stories need villains. In the pop-culture stories we share with kids, bad guys are always absolute villains. Their very existence is rooted in a mission to do selfish, evil things. They steal; they kill; they hurt; they destroy; they cheat. Everything they do is bad and selfish. They are obviously evil, and their actions are almost always sinful. Look at Lex Luthor, Green Goblin, Joker, Maleficent, or the Wicked Witch of the West, Dr. Doofenshmirtz, … even Yosemite Sam is chronically mean. However, storybook villains are simply a metaphor. Like many young kids, my son fantasizes about being the hero who will save the world from villains. He tells me what he will do if he ever has to confront “evil” bad guys, and it’s cute. I admire his moxy to stand up for what’s right. I am concerned, though, that he believes villains are easy to spot and any confrontation in his life will only come from evil. I’ve never met an evil villain. I’ve met people I don’t like; people who cheat; people who have different values from me; even people who have committed crimes. As much as I think these people are acting bad, or have made poor choices, I don’t believe they are “evil” in the way storybook villains are evil. Real life ‘bad guys’ are far more subtle. I want to make sure my son knows how to deal with people he disagrees with, people who want something that conflicts with his own values, or people who play by the rules but aren’t playing “fair”. These are people he will encounter every single day, and they are not evil. Misguided, maybe. I would even say ignorant, for some. I believe that all people are essentially good, but selfish. I don’t believe human beings are inclined to do things that harm or affect others until our own basic needs are compromised. I don’t believe humans are evil, but they do make choices that push the limits of basic needs. They push the limits of selfish. Which brings me back to mental health. We need to be aware of mental health issues, and how they amplify our selfish inclinations and cause us act out. When we slip too far—delusions, narcissism, sociopathy, psychosis—it’s dangerous. I think it’s too easy to claim that someone is simply evil, and effectively wash our hands of the problem. To ignore mental health issues—a diminished capacity to interact with other people without causing harm—is where we are breaking down as a society. So I want my son to know that bad people aren’t just evil. I want him to know that some people just want something or do something that we don’t like. And I want him to know that sometimes regular people need help to work through confusing thoughts. Sometimes our brains break, and we should seek help. And yes, he can also learn how to confront a truly evil villain, should the need arise. This entry was posted in Current News, Rules, Thinking Differently, Values and tagged evil, health, inspiration, mental health, villain, violence. Bookmark the permalink. 8 Responses to Evil doesn’t always wear a big, black hat. I most certainly do. Do you (the generic “you”) think that Tim McVeigh, all the 9/11 murderers, Hitler, Stalin, Mao, Saddam, the CO shooter, and so many others on big and small scales all had mental illness? At least we can point to God as a higher authority than any human – mom and dad included. Hitler thought he knew what God wanted…so do the Islamo-Nazi terrorists plaguing us today. Bruce – thank you. As expected, I find your comments interesting. I agree with you. Value are definitely learned through our environment and relationships. These are how we establish our sense of right and wrong, yet also determine what we feel is worthy of defending. Do I believe the infamous killers we’re mentally ill? Yes. They saw the world around them—the same world we all see—through a very different lens. They each filtered the world through their delusions, sociopathy, and obsessions, and ultimately came to horrific conclusions about what they needed to do. The part of our brains that says “don’t do that” didn’t work for them. I realize that there were other factors that allowed them to carry-out their atrocities, but deep down I just believe they were terribly, terribly broken. Perhaps this is semantics. I say ill, or broken. You say born evil. But we are both talking about nature, not nurturing. I absolutely 100% concur. A few days ago, my 9YO daughter wante to walk home alone and I said no. She said “Why? You can trust me!” I replied that yes, I could trust her. It was other people I couldn’t trust. We had a big talk about sick people who find it hard to decipher right from wrong. It’s a scary world out there and our need to be seen to be perfect means fewer people are willing to admit they may need help. Thank you for your comments. I find this age (around 8 – 10 years old) to be a difficult age in helping kids understand the real world a little more. We want to give them more autonomy—they aren’t toddlers, anymore—but they haven’t been exposed to things that demand we stay alert. The scary things. I don’t want a paranoid child, but he still needs more street smarts. “Our need to be seen as perfect…” This is the root of the stigma—you’ve articulated it nicely. Well said. Any kind of thinking that favors absolutes and black & whites over ambiguity and grey areas is foolishly simplistic at best and dangerous at worst. Agreed. I am currently working on a post about the value of nuance, especially in parenting. ‘Absolutes’ are simply lazy thinking. Wow! Some really great ideas here. Sorry I’m a year late, but I just arrived! I think we need to understand and realize that the problem of evil and evil acts are simply part of our nature. We all commit “evil” acts; are we all evil? Certainly not. The question here is the relative degree of seriousness in the act i.e. mass murders. The actions these kids performed are certainly evil, of course, but don’t underestimate the human power of rationalization. There is not a human being alive who would actually choose an evil act over a virtuous one SIMPLY BY VIRTUE OF IT BEING EVIL. Of course they choose these evil acts (obviously), but for other reasons. They become consumed by greed, lust, envy, vengeance, or pride (or something else), and become blinded to truth and goodness. Much the same way a lie compounds if it is not set right; an evil act, no matter how small, if left unchecked, will open doors to more, slightly larger evil actions. Our perspective becomes distorted and our conscience smothered. Momentary pleasures and self-gratifications turn into addictions, obsessions, and worse. I agree that people who stoop to these actions are indeed “sick”, and yes, “broken”, among other things. But I think to reduce their actions to a chemical imbalance is oversimplification; as is simply labeling them as “evil”. Their “sickness” may indeed be a chemical imbalance triggered by depression, or the other way around even. But if we take an example, such as the Columbine killings, maybe we can learn some more about the situation. Why did these boys kill in the way they did? Vengeance, pure and simple. Of course there were other things mixed in, such as envy and pride, but how did these vices get to such epic proportions, causing this gruesome act to occur? The main cause was bullying, wasn’t it? Or at least that’s what they told us in their last message. But bullying isn’t a new phenomenon, not by any stretch. And yet teenage mass murders, at least in the frequency of occurrence that we’re seeing, is. So why is it causing these and other kids around our western world to lash out in these extreme ways, taking their own lives and in some cases others’ lives as well (suicide rates are astronomically high among teens in our society, relative to historical numbers)? The breakdown of the family unit. Plain and simple. When I was a kid (born in 1980) I was bullied fiercely. I had a terrible time. I was passive and small, and so I was made a victim. The difference in my life was that I had parents who loved me to go home to; not an empty house. I was able to talk to not just my parents, but also my siblings (I had 8 of them) about my problems, and use their emotional support to GET OVER my problems. If I hadn’t had that support, the anger, hurt, and pain may have been left to fester. I may have chosen to listen to angry music and read books encouraging hate and alienation from our persecutors. I may have found a friend who shared my sentiments and our warped perspectives would have made the situation even worse, compounding our anger and resulting in a misguided action of vengeance. Does that mean I was simply “born evil”? Or did I simply descend to a point where I could think of no other way to deal with my pain? There are no evil people. Only evil actions. Society needs to be protected from those whose sense of right and wrong are poisoned, but to simply say they’re evil is not looking at reality, in my opinion. There is only one who is truly evil. Before we dismiss these lost kids as “evil” or “sick”, we need to take a look at WHY these killings are taking place. The family is broken. Dad’s golfing and mom is on instagram. TV is babysitting and playstation is desensitizing. MTV is teaching and TMZ is informing. And we ask WHY OUR KIDS ARE MISGUIDED?? Just my thoughts. Which aren’t worth much. But it’s fun to think critically. Thanks for the outlet gentlemen! Oh, and Bruce, I’m confused. How can a baby be inherently neutral and very selfish at the same time? Selfishness has never struck me as neutral. At least that’s not what I was “taught”. 😉 Again, we’re not born evil or good entirely. We have tendencies towards evil that need to be rejected, and we have a desire for the ultimate good, God, which needs to be cultivated. All of our actions fall into various levels of acceptance or rejection of these two basic premises.